Two Fridays in a row where I've worked a whole week! I don't know about you, but I'm exhausted!! 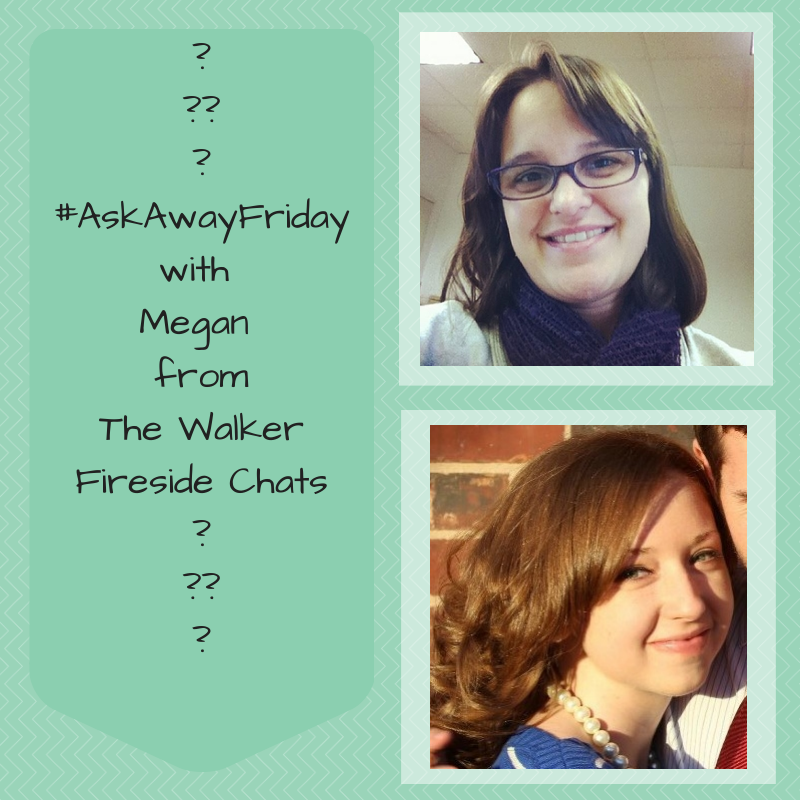 This week for #AskAwayFriday, I am pairing up with Megan from The Walker Fireside Chats. When I first saw Megan's blog I was immediately drawn in by her big picture of my wonderful home state of Texas. I know that I moved when I was about 7 or 8, but "you can leave Texas, but Texas will never leave you." I don't know if that's an actual saying, I think I just made it up! 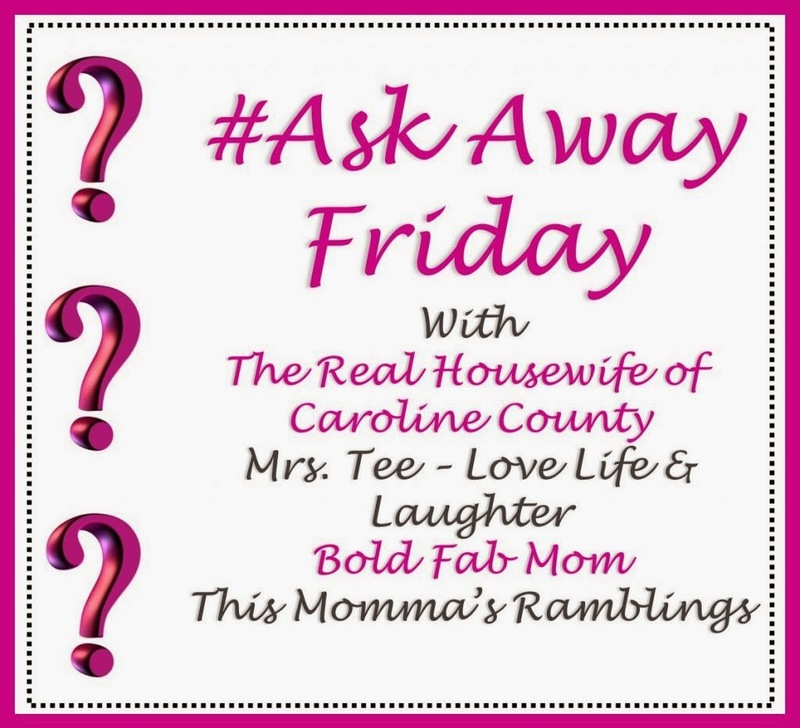 Just in case you need a refresher, #AskAwayFriday is a great blog linkup where two people pair up and swap 10 questions to be answered on their blogs. If you want to pair up with me, just let me know and I'll add you to my schedule! 1. I see you have three rambunctious, adorable children! What is your favorite thing about being a mother? My favorite thing about being a mother is watching them grow and learn. They do so many things that make me proud. And they do things that remind me of myself, or my husband, or other people in our family. It's nice to see those family traits being passed on. 2. For someone who hasn't had kids yet, what piece of advice do you wish you would have received when you became a parent? Phew! That's a biggie! Sometimes I feel like I could write a whole book on that, but then I remember that part of my book would be "do what feels right for you," so a lot of what I would want to say would be irrelevant to other people. There are a few wrong ways to parent (I'm thinking basic lack of health and safety) but there is no one right way to do it. I have friends who parent differently than I do, and THAT'S OKAY! This seems like a good time to plug a new website you'll probably want to bookmark: NoMotherIsPerfect is a place for moms to come together and celebrate the differences and shortcomings we all have. This is not a Pinterest Party!! LOL! 3. I LOVE The Big Bang Theory too! Amy is my favorite character. Who is your LEAST favorite character on TBBT and why? My least favorite character?! Seriously?! That's like picking your least favorite kid!! Sort of! I think all the characters have great attributes. I'll admit I've been a little weirded out by the fact that Raj can talk to women now. Did I miss something? What's up with that?? 4. I read your post the other day about blessings at the dinner table. What is your favorite meal to cook for your family? Where do you like to get recipes? I enjoy cooking just about everything. I've got some favorites like mom's pepper steak or dad's spaghetti. Lately, I've been experimenting with stir fry. I've tried a few recipes and tweaked them to my liking. I get recipes from Pinterest as well as from Relish! which is a great site that is letting me test drive it before I write a review. They have a lot of great recipes sorted into different categories, like "kid friendly," "crock pot," "freezer meals," etc. Parmesan cheese, pickles, peanut butter, canned beans, 3 gallons of milk, shredded cheese and Colby Jack slices. I think those are the things I buy almost every week at the store! 6. We share a kinship as born and bred Texans. Even though you moved when you were nine, do you miss anything about Texas? My friend Melissa posted a picture of bluebonnets last week and I just loved it! I remember seeing them all along the sides of the roads whereever we went. They are such a "Texas" thing to me! Also, I miss people. I've kept up with one good friend from my childhood on Facebook, but the rest of them I lost touch with. That makes me sad and I search the web for the every once in a while. The problem with women is that they tend to get married and change their names! 7. I love the Tuesday Ten link up! I need to participate in the future...what gave you the idea to co-host this link-up and where do you get your themes? Lisa and I had both been doing a list of 10 things on Tuesdays. I had been thinking about making it a linkup, but wasn't really sure how to get started. Then she posted something about making hers a linkup and wanting a partner. I took her up on it, and the rest, as they say, is history! 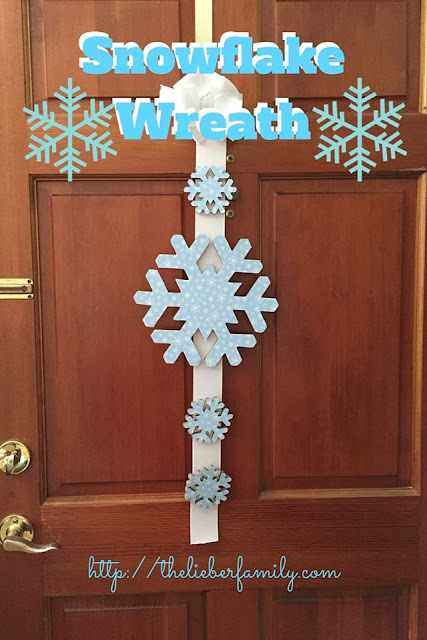 We get our ideas from a lot of places; holidays and seasonal themes, things related to current events, and some totally random ideas that just sound fun! 8. What do you love most about your current home? This was a really hard question for me. I am honestly not feeling very content here lately. I feel like we've really outgrown this space, but moving is expensive and hard. I like the hardwood floors. They are pretty hardy and they look nice in the places you can see them (we have rugs). I like the color my brother painted out living room. It's a very soothing green color. 9. Easter is coming up! What is your favorite part of celebrating Easter? Does your family have any traditions? I really like the church's Easter traditions. I like the challenge of Lent, the reminder of repentance. I love Holy Week and the stories we hear again and again. My town does a cross walk on Good Friday and i have been honored in the past to carry the cross for part of the way. I feel like Easter gets spread out nicely over more than one day and that makes the story easier to learn and internalize. The kids usually get Easter baskets on the table in the morning and then we eat breakfast and go to Mass. There's usually an egg hunt in there somewhere. This year we are meeting my parents and brothers and Ken's dad and possibly his brother, sister-in-law, and neice for lunch. 10. I always like to ask this of more-established bloggers. What advice would you give a blogging newbie about being successful? Be you. It's easy to find lots of advice on what to post and how to interact and so on and so forth. But only being genuine will make your blog worth doing. Whether you are in it to make money or not, loyal followers who like you for you are totally worth it!